iBATIS is a persistence framework used to automate the mapping between SQL databases and objects in Java, .NET, and Ruby on Rails. 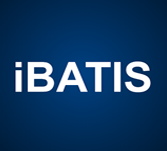 You can build better database oriented-applications with iBATIS more quickly and with less code. Ibatis tutorial is designed for Java programmers who want to understand the iBATIS framework in detail along with its architecture and actual usage. Before start with this tutorial, you should have a good understanding of Java programming language. It is also important to have adequate exposure to SQL and Database concepts.